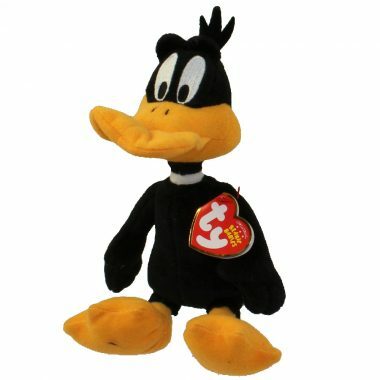 Daffy Duck is made from a black material with embroidered white eyes and a large orange beak. He has a collar of white around his neck and large, bright orange feet. Daffy Duck was released in March 2011. He is one of four Looney Tunes Beanie Babies. The other three are Bugs Bunny, Taz and Tweety. All four Looney Tunes Beanie Babies are exclusive to Walgreens stores.